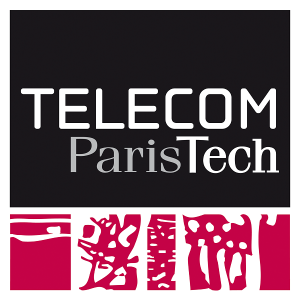 As part of the work being conducted under the supervision of Jean-Lou Chameau, a cooperation agreement has been drawn up by École Polytechnique, ENSTA ParisTech, ENSAE ParisTech, a GENES school, and two IMT schools, Télécom ParisTech and Télécom SudParis. Under this agreement, approved by the Boards of Governors, these “Écoles” have committed to creating a world-class science and technology institution. Éric Labaye, President of École Polytechnique, Élisabeth Crépon, Dean of ENSTA ParisTech, Philippe Cunéo, President of GENES, Pierre Biscourp, Dean of ENSAE ParisTech, Philippe Jamet, President of Institut Mines-Télécom, Yves Poilane, Dean of Télécom ParisTech, and Christophe Digne, Dean of Télécom SudParis, today signed the cooperation agreement between their institutions with a view to establishing “NewUni”. 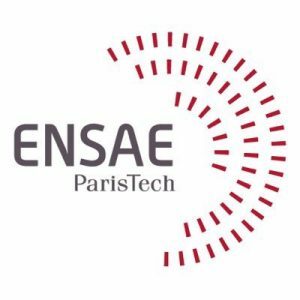 On October 25, 2017, the French President made official the creation of a higher education and research institution through an alliance between five “Grandes Écoles”: École Polytechnique, ENSTA ParisTech, ENSAE ParisTech (a GENES school), Télécom ParisTech and Télécom SudParis (two IMT schools). This grouping of five institutions of excellence, provisionally named NewUni, has deliberately adopted an international approach toward higher education and research, and with this in mind aims to develop world-class research as well as clearly defined, attractive training programs which will guarantee a high degree of employability. The programs are targeted at a variety of audiences: those enrolled on Bachelor, Engineering, Master, PhD and lifelong learning courses. The grouping will allow these “Écoles” to join forces, develop their already existing cooperation and gain in clarity and visibility, especially on the international scene, by capitalizing on their strengths and leading changes which will align NewUni with international standards. The “Écoles” all share a history, a set of common values, and the provision of training programs of excellence in French engineering. For many years now, they have been collaborating internationally in training and research, as well as in terms of infrastructure. Being based on the same campus together gives the “Écoles” remarkable potential, allowing them to magnify their strengths and set up joint projects. NewUni will focus on intensive rankings such as THE and QS which, as well as evaluating excellence in research and training, also take the success and employability of graduates into account. The goal of the NewUni institutions is to develop world-leading research in close partnership with the national research bodies which jointly supervise laboratories - CNRS, INRIA, CEA, ONERA and INSERM - and in collaboration with industrial actors and academic partners, including the University of Paris-Saclay. The privileged relations between NewUni institutions and research bodies will be further strengthened with a view to developing a common research strategy, encompassing major initiatives such as cross-disciplinary research centers promoting multidisciplinary interaction between laboratories. The “Écoles” intend to strengthen the close ties they have developed with firms. This will involve an ambitious partnership policy, both in research and training. Research in social sciences will also be bolstered, as this field is essential to innovation and its economic and societal impact. NewUni intends to establish an attractive, competitive program for the development and recruitment of faculty members, in line with those of the flagship international institutions. This program will provide support for faculty members in developing their research work and will also help recently-recruited faculty members in their first steps. Top-level research relies on high-potential doctoral students. Well aware of global competition in attracting talents, NewUni institutions will offer an ambitious doctoral program with a rigorous selection of doctoral students who have completed a Licence or a Bachelor’s degree. This doctoral program, a forerunner in France, will be managed within a unique doctoral school and will attract the most promising students capable of developing original research, thus contributing to the renown of NewUni laboratories. The long-term goal is to double the number of doctoral students in NewUni laboratories. The NewUni institutions are convinced that integration between teaching and research at all levels of education is essential, and wish to further encourage the involvement of national research bodies in training and to test innovative programs and exchanges with them. In terms of research strategy, NewUni aims both to strengthen the subject areas in which all of its institutions are renowned and to develop new fields. The five “Écoles” have created a working group in order to define these subject areas and to develop a research strategy based on the collective definition, management and evaluation of the work carried out by their research units in multidisciplinary faculties, in tandem with the national bodies responsible for joint supervision of certain units. These faculties will be set up in order to lead research, to boost interaction between disciplines and with firms, and to enhance the visibility of the research work developed by NewUni institutions. These faculties will cover such subject areas as “Natural Sciences and Mathematics”, “Engineering Sciences”, “Data Sciences and Information Technologies” and “Humanities and Social Sciences”. This form of organization will allow the “Écoles” to submit coordinated responses to the principal calls for proposals to obtain funding offered by the State, the European Union or private actors. It will also enable coordination between schools in terms of research and faculty job vacancies, in conjunction with national partner research bodies. The NewUni “Écoles” are well-known for the outstanding quality of their courses which are deeply rooted in the core and engineering sciences: top-level, multidisciplinary scientific training in coordination with the corporate world, along with cutting-edge research. 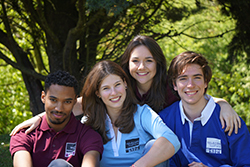 These highly competitive “Écoles” are unique in their selective recruitment methods and their graduates’ remarkable employability in the academic and corporate worlds and in government positions. The students they train benefit from an excellent staff-to-student ratio, allowing them to truly take advantage of high-quality teaching. These strong characteristics will form the DNA of the programs developed as part of the NewUni framework. NewUni intentionally positions itself in the competitive realm of global higher education by developing highly selective training courses which are clearly defined and attractive for international audiences. Going even further than the high-quality training offered through their engineering programs, NewUni institutions will offer unique learning opportunities led by internationally recognized faculty members and experts from the business world, which will enable them to attract the cream of French and international students. This common strategy will be based on the engineering training that the “Écoles” offer both individually and in blended programs and Bachelor, Master and PhD programs from NewUni, as well as lifelong learning opportunities. 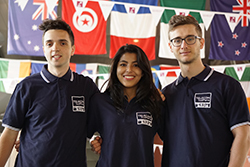 Some of these programs, taught in English and with the potential to attract the best international students, have already been successfully rolled out by several NewUni members. The Engineering programs in particular will offer students greater exposure to research and entrepreneurship. Priority will be given to social inclusion through a financial support policy and efforts to raise awareness and promote the programs among upcoming generations. All the Master’s degree programs for all the disciplines offered by NewUni members have now been defined. 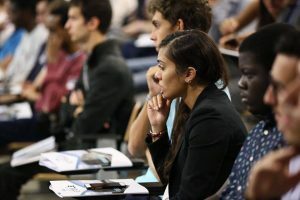 Throughout their training, NewUni students will come face-to-face with all economic sectors and discover entrepreneurship, innovation and related disciplines. All NewUni graduates will be able to boast a combination of in-depth core knowledge, initial experience in research and creativity, and will have an appetite for entrepreneurship and innovation. The “Écoles” will also work to develop and coordinate common continuing education programs and deploy a strategy for creating, enhancing and promoting online training, including MOOCs. Every student will benefit from specific support to ensure excellent employability, capitalizing on NewUni’s expertise and network of “Écoles” specialized in engineer training. Cooperation between the incubators and accelerators of the “Écoles” will be reinforced. This new network will bolster the entrepreneurial approach and will be of benefit to both researchers and students. Detection of spin-offs from the laboratories of the “Écoles” and the support they are provided will be become more mutualized. To promote the research findings, the “Écoles” will develop a common policy for patents, contract management and equity participation in start-ups. The five “Écoles” will soon share the same campus. The goal is for the campus to remain on a human scale, for it to be attractive and to have a strong international feel. Beyond its position as a recognized academic institution, NewUni needs to offer a welcoming environment, a pleasant place to study, live, be entertained, experience culture and engage in sports activities. The architectural layout must be coherent in order to foster a sense of community belonging. Meeting areas will be created to promote dialogue and mobility within the campus. To achieve these goals, operational activities will progressively be dovetailed, especially in the development of teaching and research programs, recruiting international students, hosting international faculty members, optimizing research and developing interactions with the corporate world. A network will be created to offer support for start-ups. Support services, such as infrastructure management, community life (especially housing and food services), communication, information systems, such as those used for training purposes, will also become increasingly coordinated. Fundraising campaigns will be developed and will take into account the ongoing work of the foundations. In accordance with the principles already agreed concerning its organization and operation, this group’s status will be in line with the new legislative provisions that will be introduced by the ordinance on new forms of alliances, groupings and mergers of higher education and research institutions. HEC has made the decision to partner with NewUni. Working groups from the “Écoles” and HEC have been set up to develop cooperation which will be finalized by means of a framework agreement. The “Écoles” will benefit from the opportunities offered by GENES and IMT, particularly in the areas of distance and lifelong learning programs and industrial relations. 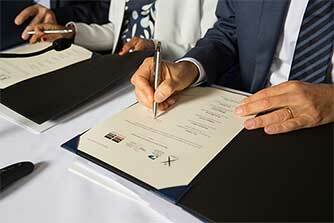 NewUni is also examining the possibility of building partnerships with other institutions and organizations. This grouping must be supported by an ambitious communication strategy. The priority is to create a striking international brand. The agency Carré Noir (Publicis Group) has agreed to assist the “Écoles” in their search for a brand name and the creation of a visual identity. The unveiling of the brand is scheduled for early 2019. A management board has been established to launch and monitor the cooperation efforts. It ensures the proper completion of all initiated actions. 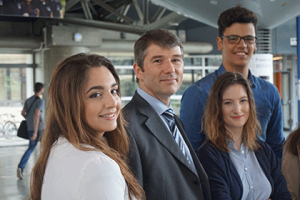 This management board, a precursor to the NewUni Executive Committee, consists of executive directors from the “Écoles” and is chaired by Eric Labaye, President of École Polytechnique. At the same time, operational working groups involving personnel and students from the “Écoles” are being put in place.